The Sentinel-5 Precursor (Sentinel-5P or S5P) satellite mission is one of the European Space Agency's (ESA) new mission family - Sentinels, and it is a joint initiative between the Kingdom of Netherlands and the ESA. The sole payload on Sentinel-5P is the TROPspheric Monitoring Instrument (TROPOMI), which is a nadir-viewing 108 degree Field-of-View push-broom grating hyperspectral spectrometer, covering the wavelength of ultraviolet-visible (UV-VIS, 270nm to 495nm), near infrared (NIR, 675nm to 775nm), and shortwave infrared (SWIR, 2305nm-2385nm). TROPOMI Level-1B (L1B) product is generated by the Koninklijk Nederlands Meteoroligisch Instituut (KNMI) TROPOMI L01B processor from Level-0 input data and auxiliary data products with the netCDF-4 enhanced model. It provides users with radiance, irradiance, calibration and engineering products. Access the data via HTTPS. Copernicus Sentinel data processed by ESA, Koninklijk Nederlands Meteorologisch Instituut (KNMI). 2018-08-23. 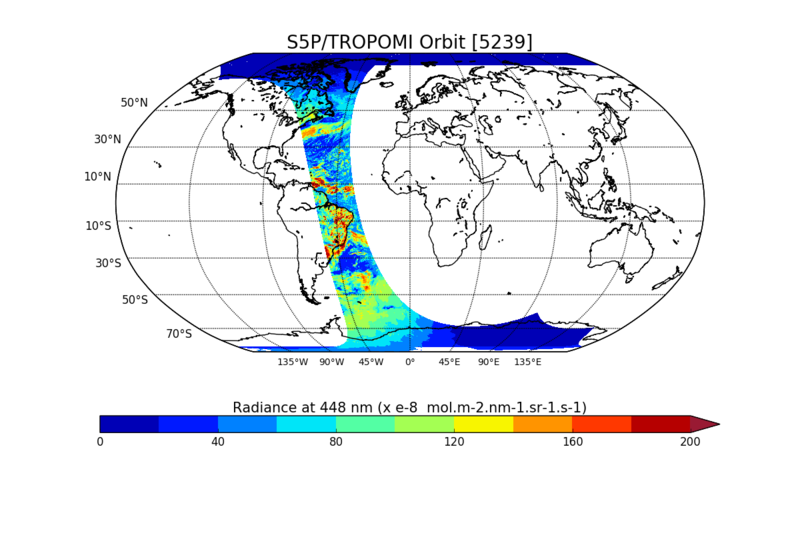 Sentinel-5P TROPOMI L1B Radiance product band 4 (UVIS detector). Version 1. Greenbelt, MD, USA. Archived by National Aeronautics and Space Administration, U.S. Government, Goddard Earth Sciences Data and Information Services Center (GES DISC). https://disc.gsfc.nasa.gov/datacollection/S5P_L1B_RA_BD4_1.html. Digital Science Data.